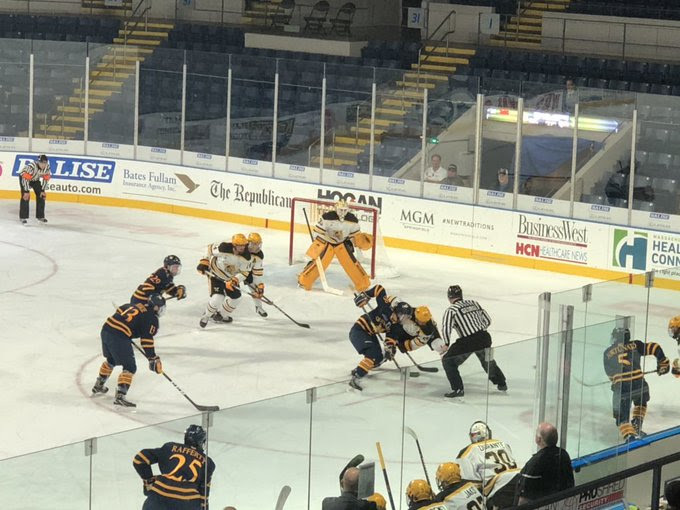 October has been a very busy month for Quinnipiac hockey not only on the ice with a 5-0 record so far but on the recruiting trail as well with four new verbal commitments picked up in the last month. The most recent of those commitments is Yaniv Perets, a Montreal native playing in the New England region for the Junior Bruins (NCDC). Perets is off to a strong start with a 12-1-0-1 record with a 1.90 goals against average and a .944 save percentage in 14 games played. He is set to enroll at Quinnipiac for the 2020-2021 season. I had a chance to catch up with Yaniv for a Q&A on his recent commitment, his hockey development among other things. Thanks to Yaniv for taking the time out of his busy schedule to do this. @QHockeyBlog: First off congratulations. What are your emotions like after making this decision to play NCAA Division I hockey at Quinnipiac? Yaniv Perets: I can't even explain them. I am just happy and fortunate to be going to such a great program like Quinnipiac. It has always been a dream of mine so I am truly excited and just speechless. @QHockeyBlog: Tell us about your overall recruiting experience? Has Quinnipiac been following you for awhile? Yaniv Perets: The recruiting process has been over several months, I visited the school over the summer. They have been out to watch several games in person or online as well during that period. It has been a good experience since they have always been honest and respectful. @QHockeyBlog: What other NCAA schools showed interest in you and what separated Quinnipiac from those other schools? Yaniv Perets: There were some other schools that had expressed interested, but I believed Quinnipiac was the best fit. After visiting the school during the summer, I just fell in love with the campus and facilities. Quinnipiac also has a rich history of moving on players to the next level and are also a team with a winning culture with great hockey and education combined. @QHockeyBlog: You are currently with the Jr. Bruins but previously played for Brockvillle in the Central Canadian Hockey League (CCHL) at the beginning of last season. What went into the move to continue playing junior hockey in the United States as opposed to Junior A in Canada? Yaniv Perets: When I got the opportunity to play with the Junior Bruins I had to take it. My goal was always to play NCAA Division I hockey and the Junior Bruins have a long history of moving players on to that level. I have been extremely happy ever since joining the Bruins. @QHockeyBlog: Many players from Quebec choose to go the major junior route. You weren't one of them. What were some of the reasons you chose this path towards NCAA hockey instead of the QMJHL? Yaniv Perets: I was always a believer in the college path over major junior. Often those who go the major junior route are done at the age of 20 years old, while those in college just start their career at 20. The college path provides great education and hockey. If hockey does not end up working out, I have a degree to fall back on. Also, a player has a lot more time to develop their game in college hockey. There are so many more reasons but those are a few that came to mind. @QHockeyBlog: You see players from other Canadian provinces go to the NCAA route but that number is not as high with Quebec kids. What do you think is the reason for that? Is it the language barrier? Yaniv Perets: I think the language barrier is definitely one of the reasons. A lot of players who don't speak English very well just don't see themselves studying in an American college. @QHockeyBlog: You grew up in a suburb of Montreal and I saw a YouTube interview when you were in Brockville that you are a Canadiens fan. Was it a bit weird putting on the Jr. Bruins uniform knowing it’s very similar to the Boston Bruins uniform? Yaniv Perets: I actually never thought of it that way until you mentioned. I don't believe it's weird at all as when I play for any team, I am proud to wear their jersey no matter where I am from. 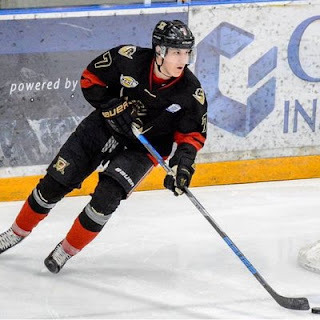 @QHockeyBlog: You are teammates with fellow Quinnipiac commit Cam Boudreau. Did he play any factor in your decision to commit to Quinnipiac? Yaniv Perets: Maybe a little since he has had nothing but great things to say about the program. He is also a fantastic player, which exemplifies the talent the coaching staff is bringing in. 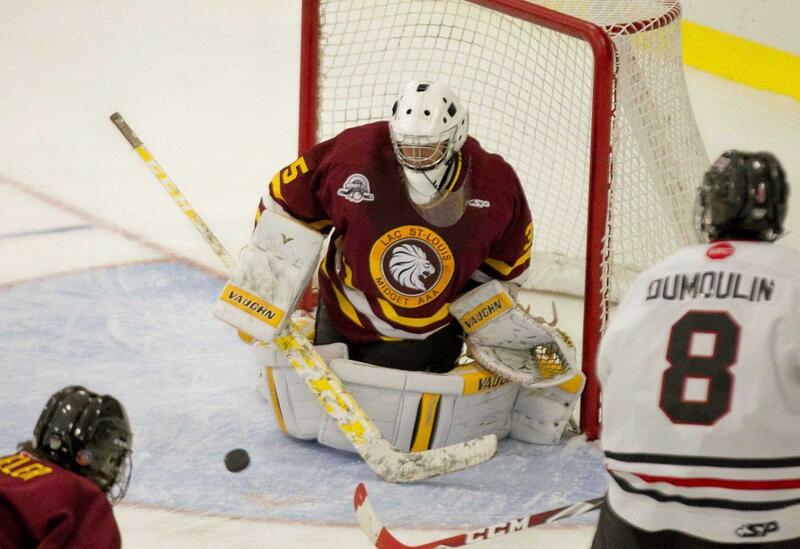 @QHockeyBlog: Tell us about about your overall game in between the pipes. What are some of your strengths and what are areas that you think you can improve upon? Yaniv Perets: As a goalie I've always believe that there is room for improvement in every aspect of ones game. I believe some of my strengths can include my technique and mental toughness. @QHockeyBlog: Your set to enroll for the 2020-2021 season. Between now and then what do you want to improve upon prior making the collegiate jump? Would getting stronger be an area you need to work on? Yaniv Perets: As I said before as a goalie I believe one can improve in every aspect in their game. Getting stronger is definitely an area that I will look to continue to develop along with getting faster and developing my game so I can be an impact player every day. @QHockeyBlog: Is there a player that you try To model your game after? Yaniv Perets: I watch a bunch of goalies and try to take bits and pieces of their game that I like. If I had to choose one, I would say Carey Price. Being from Montreal, I grew up watching him. I love how calm and composed he is in his net and how technically sound he is. I look to add some of those characteristics to my game. @QHockeyBlog: Speaking of Montreal. As I fan of the Boston Bruins, Montreal is obviously our biggest rival. I'm not sure sure there is an atmosphere as good the Bell Centre for a game especially when they play Boston. I have experienced it. Would you agree? Yaniv Perets: Yes, I would agree. I have been extremely fortunate to go see a couple games when the Bruins have played the Canadiens at the Bell Centre. There is nothing like it, the atmosphere is insane. @QHockeyBlog: How much have you been able to follow the Canadiens this season? 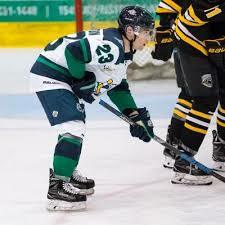 Did you know that former Quinnipiac star Matthew Peca is on the team? Yaniv Perets: I have been following the Canadiens season very closely. Yes absolutely, I knew about Matthew Peca when he was in Tampa Bay so I was happy to see him join the Canadiens. 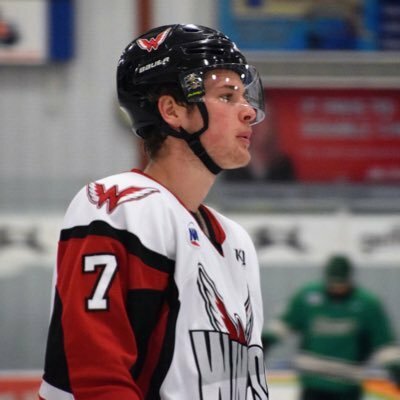 @QHockeyBlog: To this point in your life who has been your biggest influence or role model to help you get this opportunity to play Division I NCAA hockey? Yaniv Perets: I would say my parents. They have always been supportive. Since day one, they have been there through the highs and lows. @QHockeyBlog: Tell us what type of person the Quinnipiac community will get in Yaniv Perets on and off the ice? Yaniv Perets: Someone who loves hockey and is ready to show up to the rink every day ready to work and ready to learn. Off the ice , I am a very approachable and sociable guy. Yaniv Perets: I don't really play any other sports besides hockey but I do enjoy watching some movies or television shows. I enjoy hanging out with some friends as well. The Connecticut Huskies opened their season with a 5-2 win over the United States Military Academy this past Friday. Mike Cavanaugh's team is very young with 11 new freshman into the fold and 17 underclassmen on the roster. 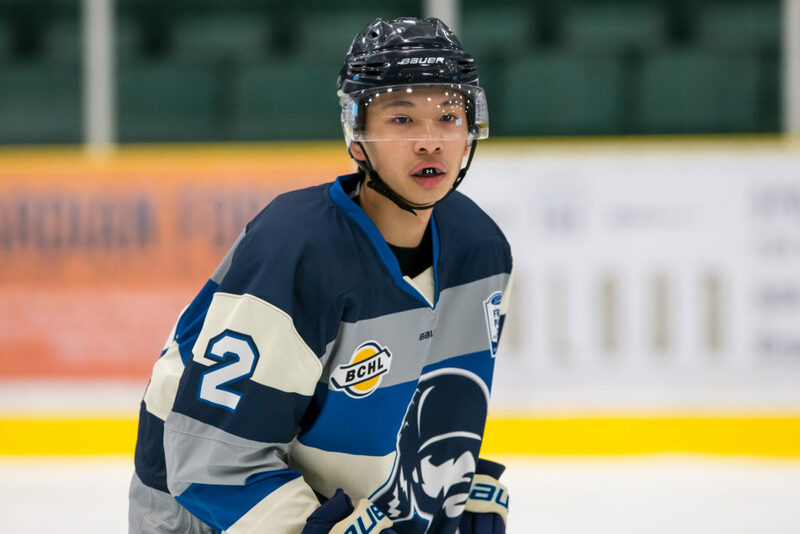 While they may be young and have inexperience they do have some talent on the roster in the form of 7 NHL draft picks including four of them who are freshman. The Huskies were picked 8th in the preseason Hockey East coaches poll. UConn lost its top two scorers from a season ago when Max Letunov signed professionally and Spencer Naas graduated. That is 52 points of offense they will have to replace. Juniors Benjamin Freeman and Alexander Payusov are the top two returning scorers for the Huskies who had 21 and 20 points respectively as season ago. Seniors Karl El-Mir and Max Kalter need to provide more offense as well. Three impact freshman NHL draft picks arrive on campus in Jachym Kondelik, Kale Howarth and Ruslan Iskhakov. Kondelik and Iskhakov have four points already on the young season. One other freshman to watch for is Jonny Evans (1 assist) who had 190 points in 194 games in the BCHL. The Huskies have a very tall defense led by captain Miles Gendron and Philip Nyberg the two lone draft picks on the blue line. Five of the seven defenseman stand 6'2 or taller but of the seven defenseman four of them are underclassmen so there is some youth and inexperience back there. This might be an area where UConn is vulnerable and where Quinnipiac could take advantage. Junior goaltender Adam Huska a New York Rangers draft pick has played the majority of the games the past two season got the start against Army and was strong giving up two goals and finishing the game with a .941 save percentage. Last season Huska finished with a 2.59 goals against average and a .912 save percentage. The Huskies also have a talented freshman in Tomas Vomacka a 5th round draft pick of the Nashville Predators who will push Huska this season to be better in net. Fresh off a thrilling 3-2 come from behind win over Vermont, Quinnipiac now plays it home opener with instate rival UConn. 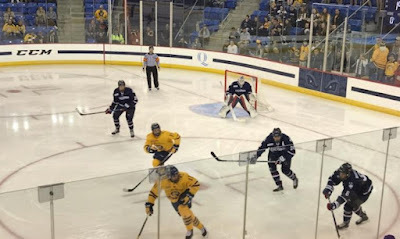 Its another good chance for the Quinnipiac freshman to continue to improve and contribute and for the Bobcats, a chance to pick up another win against a Hockey East program and to build confidence going into Friday nights premiere match-up at home against Boston College. Trailing 2-1 late in their season opener, Quinnipiac turned to its two most consistent players from a season ago to steal a road win late. Senior captain Chase Priskie blasted the tying goal from the edge of the top left circle to tie the game at two at the 17:41 mark of the third period. Tufto, Quinnipiac's leading scorer from a season ago took a loose puck and sniped a shot from the slot past Vermont goaltender Stefanos Lekkas with 15.2 seconds remaining to help the Bobcats get the 2018-2019 season off on the right foot. 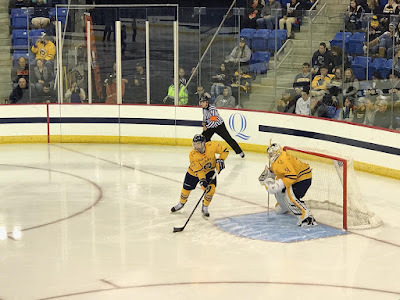 A season after posting its worst record in over two decades when they went 16-18-4, Quinnipiac saw a handful of newcomers contribute to the opening night victory. Vermont took the lead towards the end of the first period on a Derek Lodermeier goal. 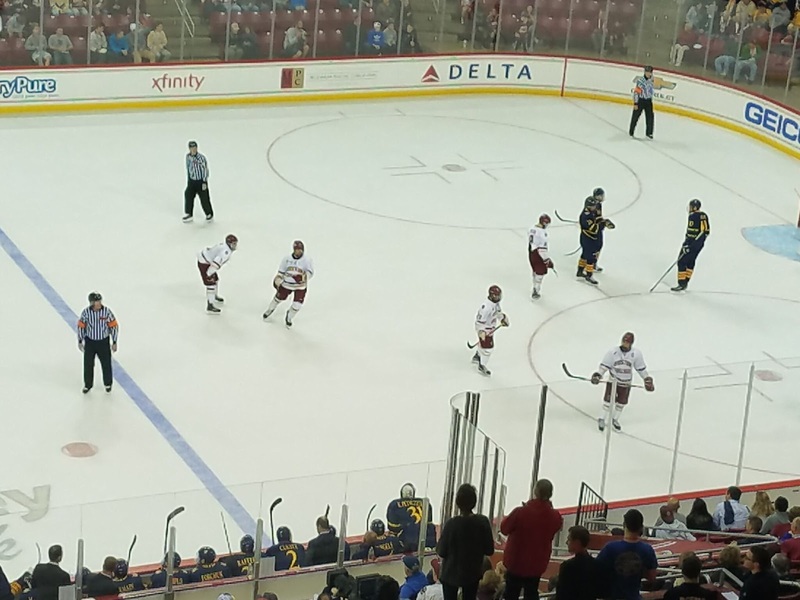 The Bobcats were held scoreless throughout the second period and it wasn't until just under four minutes into the third that freshman Wyatt Bongiovanni redirected a pass from Alex Whelan past Lekkas to tie the game. Vermont re-took the lead less than five minutes later when Joey Cipollone found the net past Quinnipic starter Keith Petruzzelli. 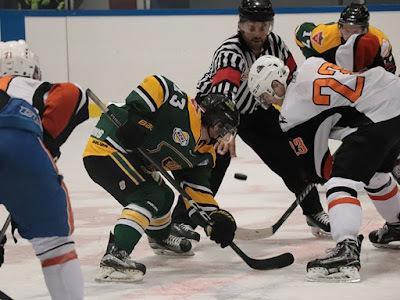 Just when it looked the Bobcats offense was going to stall and they would fall on opening night, Rand Pecknold pulled his goaltender with an offensive zone face-off and his captain delivered with the tying goal. With the game appearing to head to overtime, Tufto sent the Bobcats home to Hamden with a winning feeling. Freshman William Fallstrom, Desi Burgart and Ethan de Jong all recorded their first collegiate points with assists tonight. Craig Martin also had an assist for the Bobcats while sophomore goaltender Keith Petruzzelli made 22 saves in the win. Quinnipiac returns to the ice on Tuesday night for the home opener against UConn at the People's United Bank Center in Hamden. 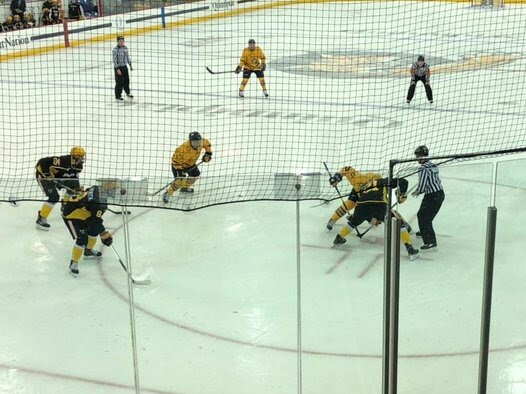 A day after picking up a commitment from Wyatt Head, Quinnipiac picked up another commitment this time when Green Bay Gamblers goaltender Evan Fear announced on his Instagram page that he was committed to Quinnipiac. The Gamblers also announced it in a press release as well. Fear is a 6'2, 196 pound goaltender that catches with his left hand. A native of Winnetka, Illinois which is just north of Chicago, Fear has played in three games so far for Green Bay going 1-2 with a 3.04 goals against average and a .898 save percentage. The commitment is possibly for the 2019-2020 season but also could be for the following year. He is the second committed USHL goaltender Quinnipiac has following fellow 1999 born Justin Robbins who plays for the Chicago Steel. 3.75 prospect Evan Fear commits to Quinnipiac. Coming off dominate year in NAHL, he’s a confident, technical goalie who moves well, can play the puck and tracks pucks through traffic. 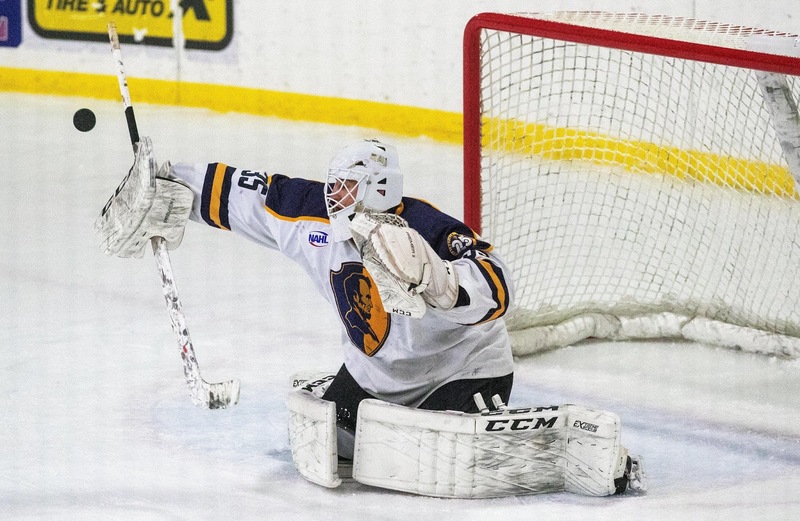 He played the 2017-2018 season with the Springfield Jr. Blues of the NAHL having a strong year in which he played 35 games going 19-11 with a 2.39 goals against average and a .929 save percentage with two shutouts. He played another three playoff games in which he had a 2.35 goals against average a .920 save percentage. Fear split the 2016-2017 between Springfield and the Dubuque Fighting Saints of the USHL. In 14 games played for Dubuque he was 5-4 with a 2.97 goals against average and a .881 save percentage. While he was with Springfield he posted a 6-4 record in 12 games with a 2.67 goals against average and a .918 save percentage. 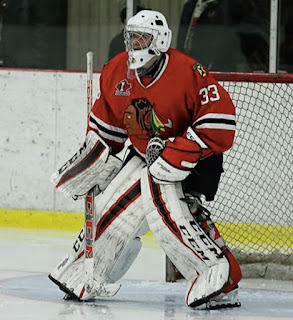 Before his junior career, he played midget hockey with one of the top programs in the country, the Chicago Mission who play in the High Performance Hockey League. 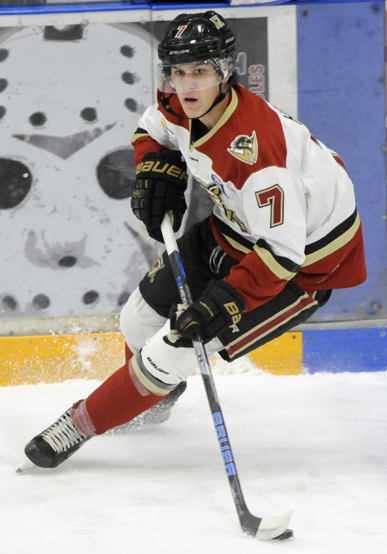 His older brother Erich is currently a junior defenseman for the University of Denver and was part of the 2017 National Championship team. Congrats to Evan and welcome to Bobcat Nation. With the 2018-2019 Quinnipiac hockey season set to commence this weekend against Vermont in Burlington we had a chance to catch up with our friends over at the UVM Hockey Blog who were gracious enough to do a Q&A about the match-up between Quinnipiac and Vermont. If you love college hockey and follow other college hockey team blogs give a follow to @TheVTHockeyBlog on Twitter. @QHockeyBlog: Coming off a losing season what are the expectations up in Burlington this season for the Catamounts? @TheVTHockeyBlog: From the fan base perspective not very high. A lot of fans are disillusioned with the program at the moment, particularly with the odd timing of Kevin Sneddon's extension last season. Our top scorer from last season, Ross Colton, left after his sophomore year for a professional contract. The Michigan win last weekend may have given fans reason to hope, especially because there is talent on this team, but I think we're still keeping our expectations tempered. I think most people would consider a successful season to be "make the damn playoffs'. @QHockeyBlog: How stunned were you they beat Michigan in Ann Arbor? @TheVTHockeyBlog: I'm still trying to process that game, ha ha. On the road, in one of college hockey's most hostile road environments, against a preseason top-five team, during their homecoming is not a game I expect to win even in a good year. I hope it's a sign of things to come, but again, trying not to overreact to one game. 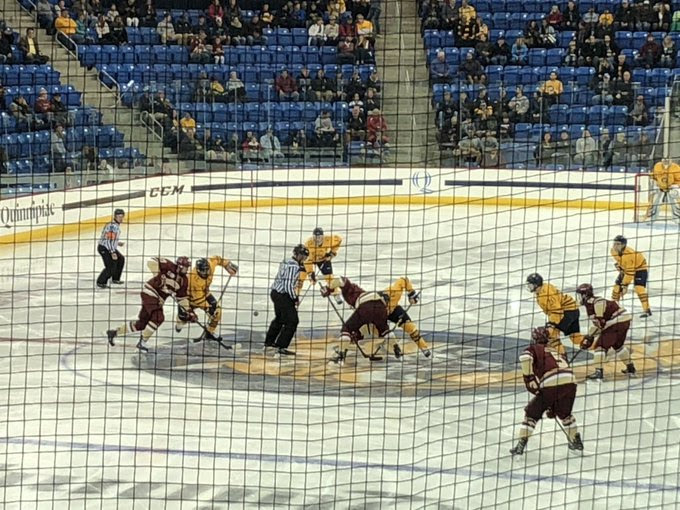 @TheVTHockeyBlog: What are the expectations for Quinnipiac this year coming off a disappointing 2017-2018 season? @QHockeyBlog: From the fan perspective I think finishing with a potential top 4 finish in the ECAC and a winning season would be something nice to accomplish. Inside that locker room my guess is they have much higher expectations. I picked them 5th in the media poll for the ECAC and it would not surprise me if they topped that depending if a lot of the freshman contribute right away. This team has 12 incoming freshman the most they have had in a few years and limited upperclassmen. In order for great success this year it will have to be the young kids playing well. @TheVTHockeyBlog: You mention the freshmen, who are some of the big names to look out for that may make an impact right away? @QHockeyBlog: In terms of the freshman that should make an impact right away are Ethan de Jong, Wyatt Bongiovanni, William Fallstrom, Desi Burgart and Peter Diliberatore. The first four are forwards and Diliberatore is a defenseman and a draft pick of the Vegas Golden Knights. 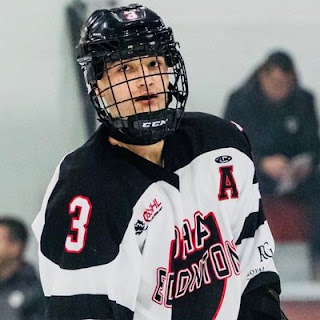 Diliberatore is also a true freshman and making a huge jump from prep hockey to NCAA hockey so there may be some adjustment for him in terms of the speed of the college game. @QHockeyBlog: With the loss of Ross Colton who is Vermont looking to have score for them this season? @TheVTHockeyBlog: I think Vermont is trying to replace him by improvements across the board since they can't straight-up replace his skill level. 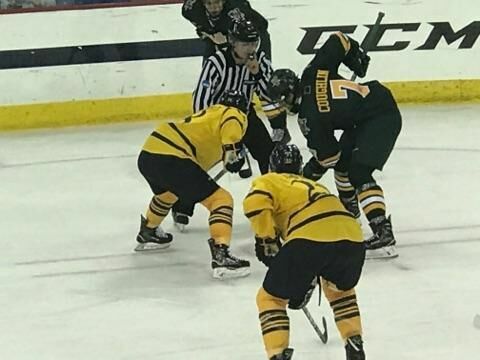 The top two lines both played very well against Michigan, especially the top line of Matt Alvaro, Liam Coughlin, and Alex Esposito who combined on Vermont's first two goals. Esposito was sneaky good last year and appears to have picked up where he left off. I'd also look for more from sophomores Bryce Misley and Vlad Dzhioshvili; both had disappointing freshman years (though Dzhioshvili's was mostly due to injury), but those two looked good on a line with classmate Martin Frechette against Michigan. @QHockeyBlog: What would you say are the strengths of this Vermont team? @TheVTHockeyBlog: I think the biggest strength is the forecheck. During the Michigan game, they were very aggressive on the forecheck, constantly swarming the Wolverine defenseman and daring them to make mistakes. They do have a lot of speed on the team which helps them pull this off. It also helps that the Vermont blue-line is a bit more experienced now. You could see some "young team jitters" from them last year, and while they did give up a ton of shots in Ann Arbor I do think they have the potential to at least be decent. @TheVTHockeyBlog: What's the goalie situation looking like for Quinnipiac? Keith Petruzzelli came in with a lot of hype last year but wasn't the stalwart that many expected. @QHockeyBlog: Your guess is as good as mine. Both goalies are talented but Petruzzelli has the most upside of both of them. I really think that coach Pecknold needs to find a goalie that stays hot and ride him. If you look at Quinnipiac’s past success from 2013-2016, it was Eric Hartzell who dominated in 2013 en route to the Frozen Four as a Hobey Baker finalist followed by Michael Garteig in 2014, 2015 and 2016 setting the school record for wins and leading them to another Frozen Four. The last two years you saw a tandem and the results were a solid season two years ago just missing the NCAA tournament and the first losing season in 22 years last year. I think it’s a must to have consistency in net and ride a hot net minder. 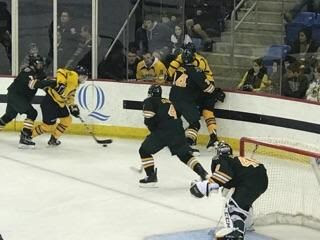 @QHockeyBlog: What are some of the weaknesses of Vermont that Quinnipiac could possibly exploit this Saturday? @TheVTHockeyBlog: I know I just said the defense is a bit more experienced, but they did show some early-season jitters against Michigan, I think the shot attempts were something like 80-40, and while a lot of that was on Michigan's power play and just basic score effects, it's something to keep an eye on. @TheVTHockeyBlog: What are some of the Quinnipiac's strengths and weaknesses? 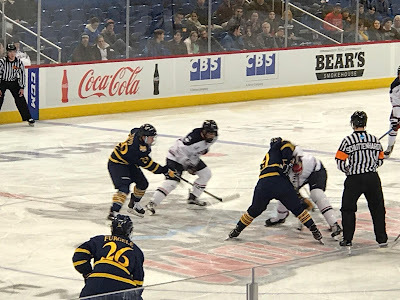 @QHockeyBlog: The top four of the Bobcats defense should be good led by captain Chase Priskie and they have two good goaltenders that just need to show consistency. I would say the offense is a weakness as they were not very good last year. But they can definitely change that with the young kids breaking out and some of the upperclassmen having good years. @TheVTHockeyBlog: What's the biggest key to beating this team? @QHockeyBlog: I would say you have to beat them in the neutral zone, win lose pucks and have a strong forecheck. That is normally how Quinnipiac has its success against most teams. @TheVTHockeyBlog: What do you expect from this game? As the first game of the season, do you expect some kinks with such a large incoming class? @QHockeyBlog: They already played an exhibition game, a 5-2 win over the University of Prince Edward Island. 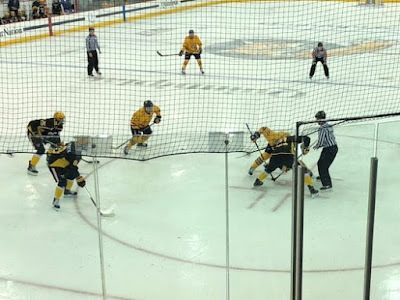 The offense was very solid and they moved the puck well but Rand Pecknold said they still have some things to clean up prior to the Vermont game. There could be some early freshman jitters but we won't know until Saturday. Quinnipiac really needs to win this game to get off on the right foot this season and to build confidence.